My whole family loves Mexican food. And you can bet that we enjoy Taco Tuesday almost every week. 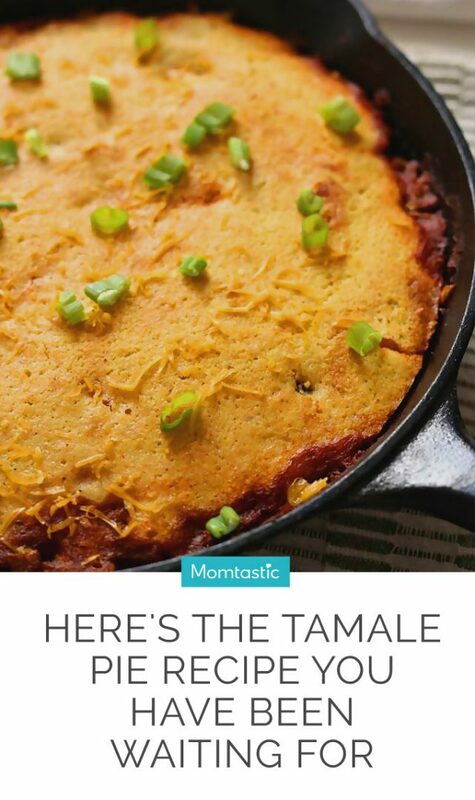 But I recently introduced tamale pie into the mix and it was a total game changer. 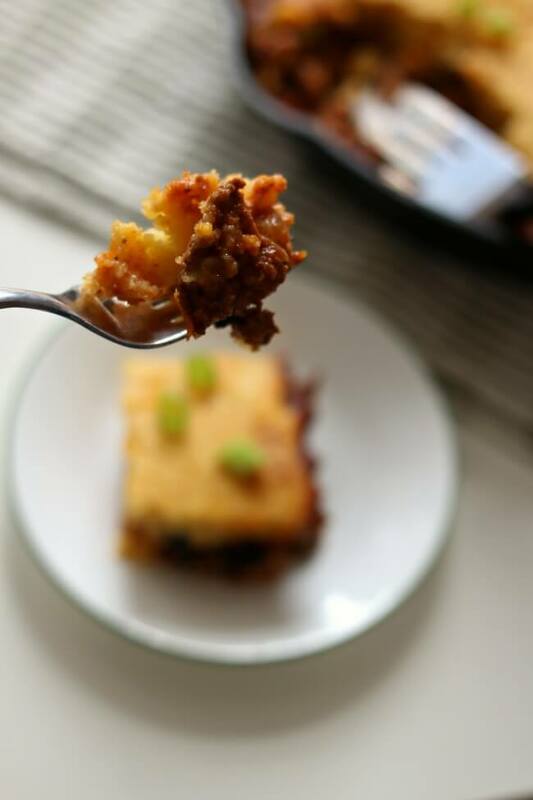 Tamale pie has a chili-like filling (think ground beef, tomato sauce, onions and green peppers) with cornbread baked right over the top. Obviously, it is the best thing ever to come out of an oven because it involves both meat and carbohydrates, and is baked in a cast-iron skillet to boot. If you don’t have a cast iron skillet, you can use another pan that is oven safe, You can cook the filling in a pan on the stove, and then transfer the mixture into a 9×9 inch casserole dish. And have I mentioned that it’s all made in one skillet making clean-up super easy? There is nothing worse than trying to enjoy a nice dinner with my family and then gazing around the kitchen and seeing a huge mess. It just takes all the joy out of eating. 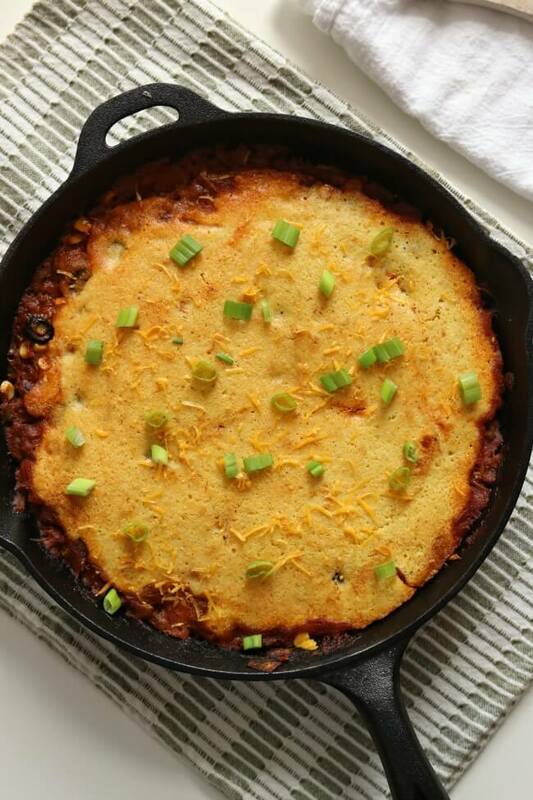 That’s why I loved recipes like this skillet tamale pie. There are so few dishes to clean up. I cleaned up my dishes while the tamale pie was baking. Easy peasy. 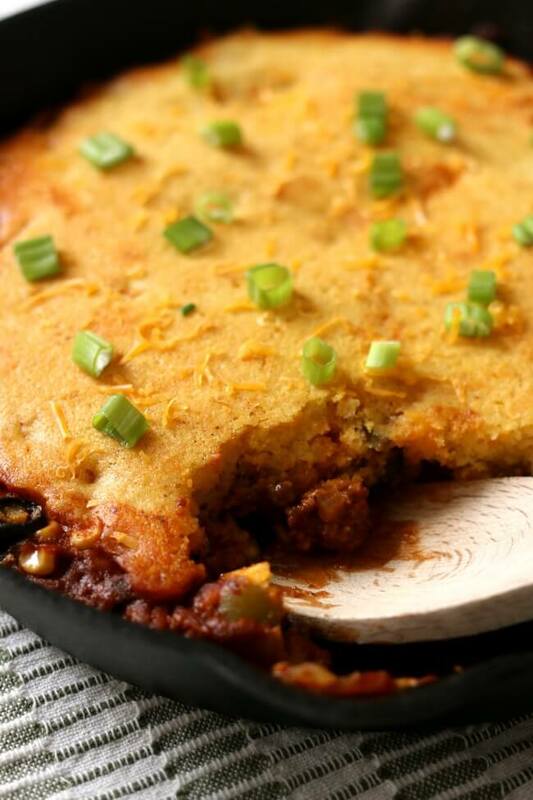 This tamale pie recipe is easy to make and it’s super easy on the budget. Make it for your family tonight and watch it disappear in minutes! Step 1: Heat a large cast iron skillet on the stove over medium high heat. Add in the ground beef and onion. Cook until meat is lightly browned. Add in the green pepper. Cook until onion and green pepper are tender. Stir in the tomato sauce, corn, olives, garlic powder, salt, chili powder and black pepper. Simmer for about 10 minutes and then stir in the cheese. Step 2: Preheat your oven to 375°F. 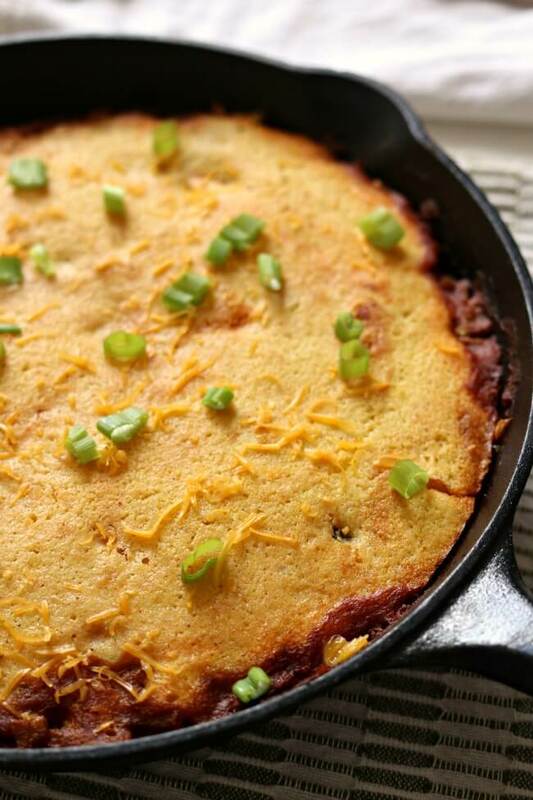 Prepare your cornbread batter. In a medium bowl mix together the butter and sugar. Stir in the egg. Add in the buttermilk. Stir in the flour, cornmeal, salt and baking soda. Spread the batter evenly over the top of the mixture in the skillet. 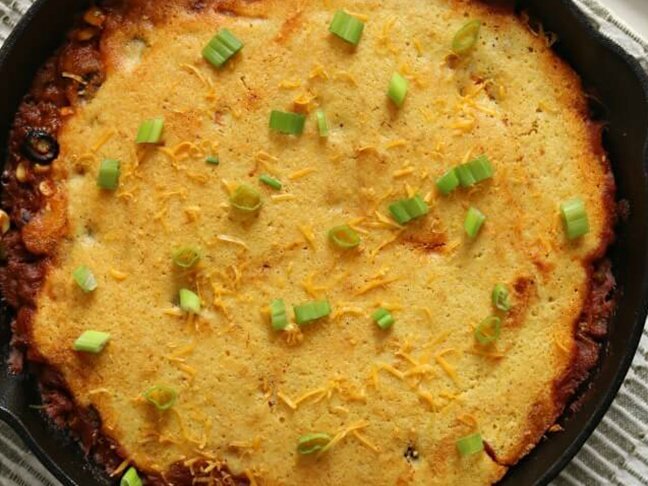 Step 3: Bake in the oven for about 20-25 minutes or until cornbread is cooked through. Let the pan sit for 5-10 minutes then scoop out servings and enjoy!